You'll find all the latest news and specialist articles published by DENSO Group Germany here. 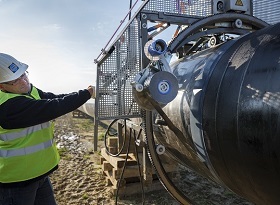 April 2019 - Restoration of a drinking water pipeline in southern Germany. DENSO protects weld seams from corrosion very quickly and efficiently using a new, floating installation method. November 2018 – In an interview with the Russian professional journal “MARITIME PORTS” DENSO GmbH is explaining the advantages of MarineProtect™, a corrosion protection system for marine hydraulic engineering. November 2018 – The new construction of the MONACO high-pressure natural gas pipeline is an important milestone for security of supply in the region. Approx. 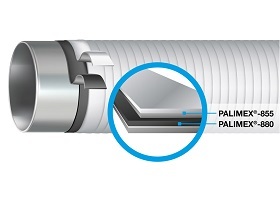 3,000 welded seams are wrapped with DENSOLEN® tapes by using DENSOMAT®-11. 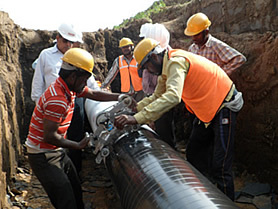 Thus an extremely efficient construction process for the coating of welded seams is ensured. 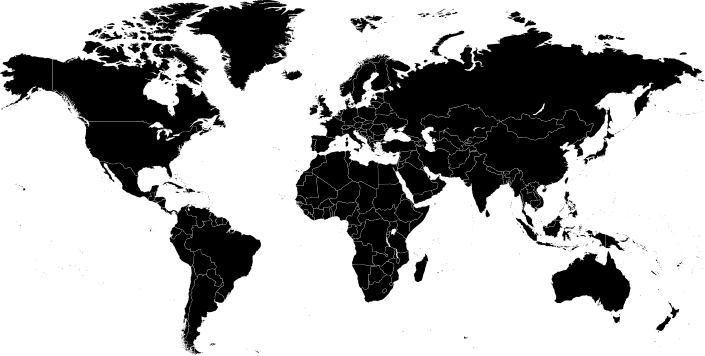 November 2018 - There is a great danger that water-polluting substances produced in animal husbandry will contaminate ground- and drinking water. The joint compound TOK®-Sil Resist meets all demands of the new legislation for liquid manure, slurry and silage effluent plants. Therefore, it makes a valuable contribution to environmental protection. November 2018 - DENSO Group Germany, leading manufacturer of corrosion prevention systems for welded joints, pipe rehabilitation and pipe coatings, expands its comprehensive product range with new PALIMEX® protective tapes for pipes and station construction. September 2018 - DENSO Group Germany, a leading manufacturer of products for corrosion protection and road construction, is delighted about extremely positive feedback from customers about successful use of TOK®-Band A and TOK®-Band SK, two years after their introduction. September 2018 - DENSO Group Germany has been awarded the largest field-joint protection contract for the EUGAL pipeline in Germany. Three quarters of the 48,000 joints along the EUGAL natural gas pipeline – the most important ongoing new construction project in Central Europe – will be protected by the DENSOLEN®-N60/-S20 tape system, which will be applied using DENSOMAT® wrapping machines. 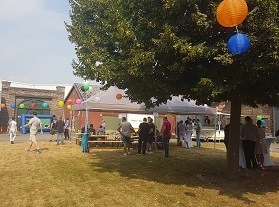 A relaxed atmosphere, good food, cold drinks and a lot of fun – our summer party 2018 was a great success. 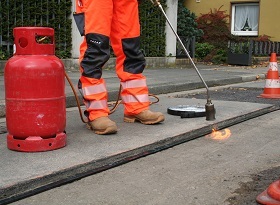 October 2017 – DENSO Group Germany, leading manufacturer of corrosion prevention systems for welded seam coatings, rehabilitation and complete pipe coatings, is supplying corrosion prevention materials for approximately 3,000 steel pipe welded seams for the construction of the MONACO transport line in the east of Munich. September 2017 – In April 2016, the updated additional technical terms of contract for joints in road construction – the so-called “Zusätzliche Technische Vertragsbedingungen (ZTV Fug-StB 15)” – have been published in Germany. 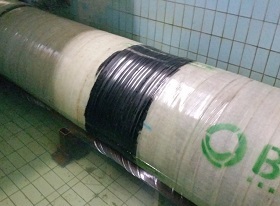 This news article takes a closer look at the technical codes and highlights the advantages of bitumen joint tapes of the TOK®-Band range. February 2017 – The article is presenting the advantages of MarineProtect™ corrosion prevention systems for jetty piles operated in seawater in comparison with other existing methods. January 2017 – On highway A67, Germany, TOK®-Band SK Drain was successfully used to finish joints in open-porous asphalt road surfaces. Leverkusen, 15 January 2017 - DENSO Group Germany, the leading provider of corrosion prevention products and innovative sealing technology, launches a range of innovative new products that will mark a decisive improvement in the repair of damage to asphalt roads. The launch, on 15 January 2017, marks exactly 40 years since the first TOK® bitumen joint tapes for road construction were first brought to market. October 2016 – DENSO GmbH, Germany introduces an effective corrosion protection system for buried steel in pipelines in HDD. May 2016 – DENSO GmbH presents a new system for pier and harbour corrosion protection of piles and pipes against highly aggressive sea water. Leverkusen, May 2016 – DENSO Group Germany, leading supplier of corrosion prevention and sealing technology, launches its new corporate website. The website offers substantial new content, optimised technology and an appealing, modern design. DENSO Group Germany is official promoter of the Rhineland Olympic elite sports facility (OSP). Leverkusen, March 2016 – Good news for elite sport in the Rhine region: DENSO has been promoting the Olympic elite sports facility in the region since the start of the year, showing the company’s commitment to the local community in Leverkusen. September 2015 - In recent years there have been recurring instances of tragedies in which HGVs have crashed through the central reservation and encroached on lanes of oncoming traffic. 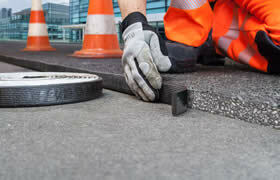 May 2015 – Until now, a major challenge in the use and installation of porous asphalt was the finishing of seams and joints. June 2013 - Human beings need to be well prepared for extreme climate conditions, but does a good product need to be prepared too? October 2012 – Traffic areas are under increasing pressure due to increasing traffic and greater axle loads.